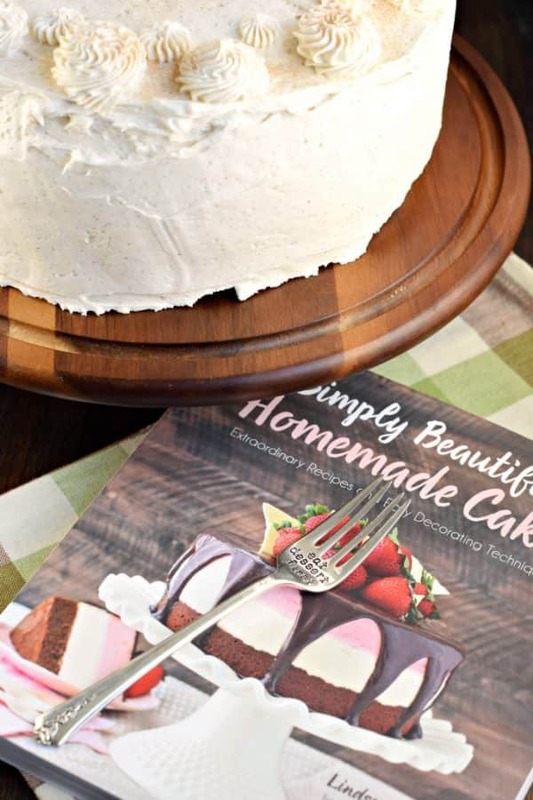 But seriously, when my friend Lindsay asked me to bake a recipe from her new cookbook, Simply Beautiful Homemade Cakes, I was like “heck ya I will.” You guys, every single recipe in this cookbook looks amazing. And I know this because there are photos for every single recipe too. DROOL. Know what else I love about this cookbook? 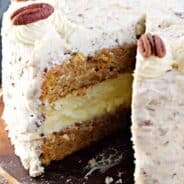 The pages of tips and tricks for measuring, preparing your pans, cake storage, etc. ALL of which have plenty of photos! And let’s not forget the last chapter which is how to take your cake from average to beautiful. I really should have paid attention to that chapter, because I completely fail when it comes to decorating a cake. I don’t know if it’s just my excuse for laziness, but I am the worst. Lindsay has gorgeous step by step photos for even the worst, like me, haha!! 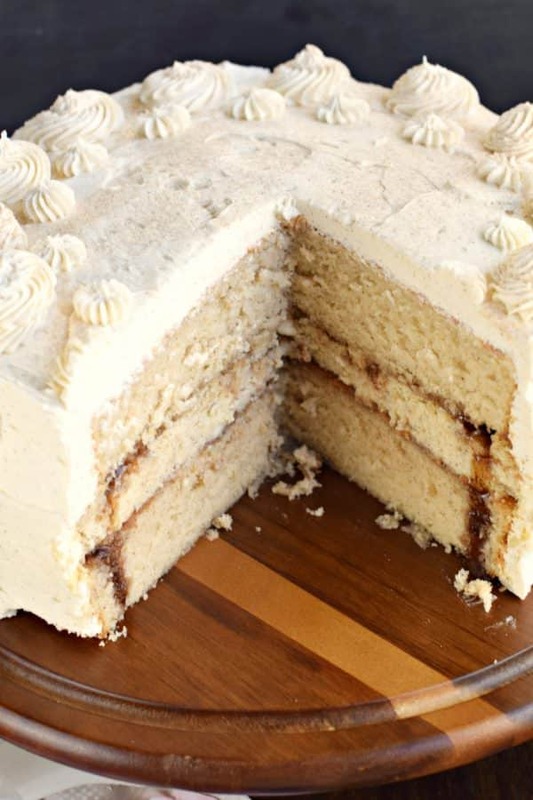 In looking at all of Lindsay’s gorgeous recipes, I decided to go with the Cinnamon Roll Layer Cake. But I added my own twist. You see, I don’t own (3) 8-inch cake pans. And I didn’t realize I needed 3 until the day I decided to bake this cake (does anyone else skim directions to a recipe and THINK they are prepared only to find out they are not?). Well, I improvised here and used my (2) 9-inch cake pans. And I prayed that the cake would turn out (which it did, with a little timing change)! I also baked up a sweet, cinnamon cheesecake to put in the center, making this a Cinnamon Roll Cheesecake Cake. Why? Because I FREAKING LOVE CHEESECAKE CAKES. It’s the ultimate cake. The cake that keeps on giving. Unlike a turducken, this one is delicious (although maybe a turducken is tasty? not sure). But back to the cake. 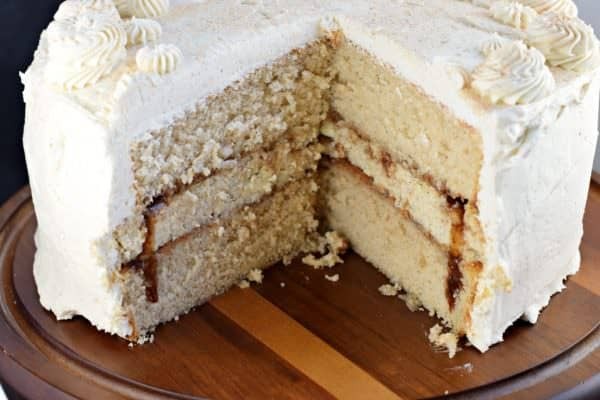 I still resulted in a stunning triple layer cake, and I even used her delicious cinnamon glaze (DO NOT SKIP THIS STEP). READ the directions before starting. Don’t skim them like me. Read them. And double check your ingredients, as well as the time it takes to bake and assemble this beautiful dessert. Bake the cheesecake layer first. You can even bake the cheesecake layer a day in advance and refrigerate it until you’re ready to use. You want the cheesecake layer to be chilled before assembling and eating anyway, so it just makes sense to start on that one early! I always use a water bath for my cheesecake, it’s not as hard as it sounds, and it really does help keep your cheesecake from cracking (and keeps it moist)! Just make sure to follow my directions and wrap your springform pan bottom (on the outside) with foil. You don’t want water creeping into your cheesecake. Gross. I always line the bottom of my cake pans with parchment paper. Trace your cake pan on the parchment, cut out the circle and place it in the bottom of the pan. Grease it with baking spray too…it’s like the extra step to make certain that your cakes will release! I also use these Wilton bake even strips. I swear by them. I don’t like to level and slice a cake, mainly because I don’t like waste. But also because I’m horrible at making it even, it’s like grade school bangs…you keep trimming and trimming to make it even till eventually you’re like “WHAT HAPPENED HERE.” Get the bake even strips. Trust me. Lindsay’s frosting recipe calls for a combination of butter and shortening. Which I’m sure is delicious, but in my failure to read a recipe, I realized I didn’t have any shortening on hand. So I used an all-butter version of her frosting. And it’s okay, because I needed less frosting since I wasn’t putting any between my layers. We have cheesecake in there. I’m not a savage, I don’t NEED frosting between layers of cake and cheesecake (although I’m sure it would be amazing). Don’t forget the cinnamon glaze layer. I poured half on my bottom layer of cake, and the remaining half on top of the cheesecake. That way it looked like the glaze was in the center only. DELISH. 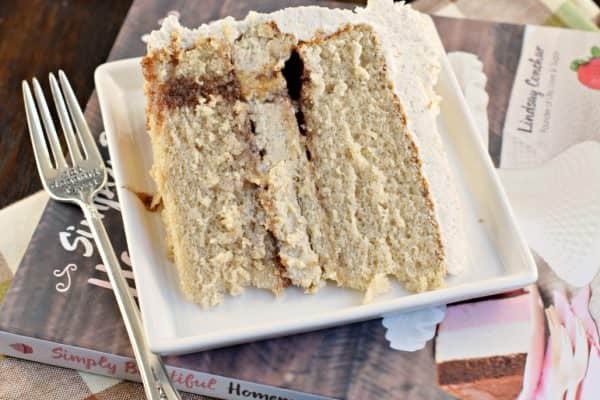 Finally, add a few swirls of frosting on top of the cake with any tip on hand…or follow the gorgeous photos in Lindsay’s cookbook! I know you can do it. Finally for real….ENJOY. And share. This is a LOT of cake. And I’m a pretty good judge of servings…this one feeds a crowd! Perfect for the upcoming holidays, a special birthday, or a really hungry group of athletes! If you have a cake lover in your family, this would make a great holiday gift. Pair it with a beautiful cake stand or cake server and WHAM, you’re done. And hopefully it’s the gift that keeps on giving, meaning your family will BAKE you a cake to share! You can purchase Simply Beautiful Homemade Cakes on Amazon! 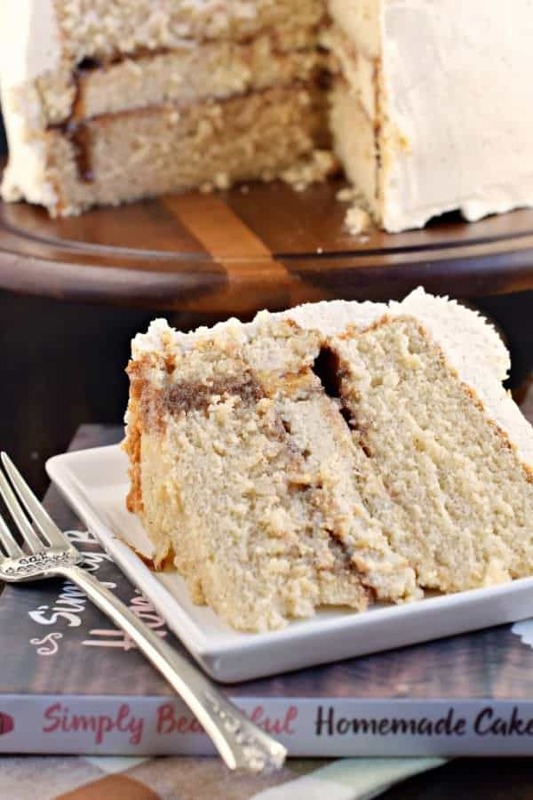 If you're looking for a delicious dessert, give this Cinnamon Roll Cheesecake Cake a try! 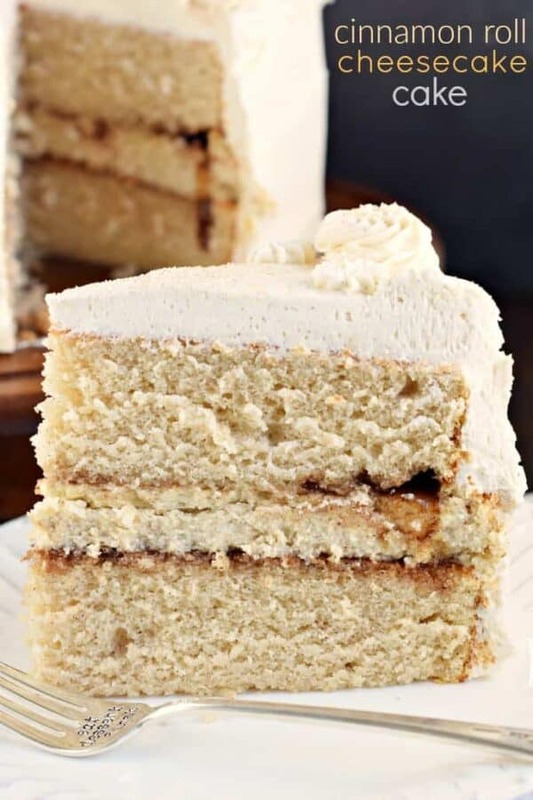 Layers of homemade cinnamon cake and cinnamon cheesecake topped with a sweet, cinnamon frosting! Preheat oven to 325°F. Using a large roasting pan on the lower 1/3 of the oven, preheat the pan. Prepare 9-inch springform pan by wrapping the bottom of the pan (outside) with a double layer of foil. Spray pan with nonstick baking spray and line the bottom (inside) with a circle of parchment paper. Meanwhile, boil several cups of water. Beat cream cheese with sugar and salt until creamy and fluffy, about 2-3 minutes. Add in eggs, one at a time, beating well after each addition. Beat in sour cream, heavy cream and cinnamon. Pour into prepared springform pan. Place pan in the center of the preheated roasting pan. Pour boiling water, slowly, into the roasting pan, until about 1-inch of water comes up the sides of the springform pan. Bake cheesecake for 45 minutes. Turn oven off and let cheesecake sit an additional 30 minutes in oven (without opening oven door). Remove from oven and cool completely in the pan. Preheat oven to 350°F. Line the bottom of 2 (9-inch) cake pans with parchment paper. Grease the sides with baking spray. Set aside. In a large mixing bowl, beat the butter and sugar together on medium speed until light in color and fluffy, about 3-4 minutes. Add the sour cream and vanilla extract, and mix until combined. Add in egg whites and beat until combined. In a separate bowl, combine the flour, baking powder, cinnamon and salt. Set aside. In a small measuring cup, combine the milk and water. Set aside. Add half of the flour mixture to the cake batter bowl and beat until combined. Add half the milk mixture. Repeat, scraping down the sides of the bowl as needed. Divide the batter evenly between the prepared cake pans. Bake for 35 minutes. Remove from oven and cool for about 5 minutes in pan. Then remove from pans onto a wire rack and cool completely. Add the powdered sugar, brown sugar, and cinnamon to a small bowl. Whisk to combine, slowly adding the water, stirring until smooth. Set aside. Beat the butter for 3 minutes until fluffy and pale in color. Add in vanilla, powdered sugar, cinnamon and milk. Beat an additional 3-4 minutes, scraping down the sides of the bowl as needed. Set aside. Place first layer of cake on a cake stand. Pour about half of the cinnamon glaze over the top of the cake, being careful not to let it drip past the edges. 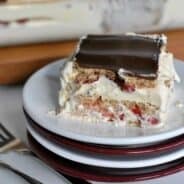 Top with layer of cheesecake. Pour remaining half of the cinnamon glaze over the top of the cheesecake layer. Add the second layer of cake. 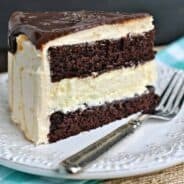 Spread frosting over sides and top of cake. You can reserve about a cup of the frosting to add to a decorator bag with a tip to make swirls on top (or use the instructions in the cookbook to make a beautiful design). Sprinkle with cinnamon sugar topping if desired. I have a huge weakness for cake too! The frosting is perfect but not too much! I can’t wait to check out this cookbook! I’m the queen of thinking I’m prepared for a recipe, only to realize at the exact last second that I either need something that I don’t have OR that something needs to chill for exactly 10 years before you can move on to the next step (and it’s already 3:00 p.m.). Haha! Anyway, this cake looks seriously perfect, so being a little bit unprepared didn’t seem to hurt you at all! Hi Aimee! What an absolutely gorgeous cake! I love the cheesecake layer in the middle. You and Lindsay have rocked this one for sure! what a gorgeous cake! I am definitely going to need that book! Oh my goodness, this cake looks absolutely amazing! 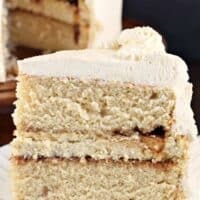 This cinnamon roll cheesecake cake has my name all over it! If it looks, tastes or smells like a cinnamon roll I’m eating it! I need to get Lindsay’s cookbook she is a master of beautiful cakes! holy gorgeousness! This cake…It’s a masterpiece that I would love to devour! The best of three things: cheesecake, cinnamon rolls and cake! Yum! Your cake looks amazing! I’m amazed you can make either Cinnamon Roll, or Cheesecake look that good – your cake looks so much better than either of them! All I can say about this recipe is WOW! I’m planning on preparing this beauty as soon as I can! What is great is that I can put the cake together and freeze it so that it can be pulled out whenever I need a fantastic dessert! I prepared this cake and I have to tell you, it is outstanding. I did use Italian Meringue for my frosting instead. My family requested that I bake this cake for our Thanksgiving dessert table.